This fine marine painting measures 62 x 47.5 cm [24 1/2 x 18 3/4] oils on canvas board, £5000, available. Hot news, Britain saved from invasion ! 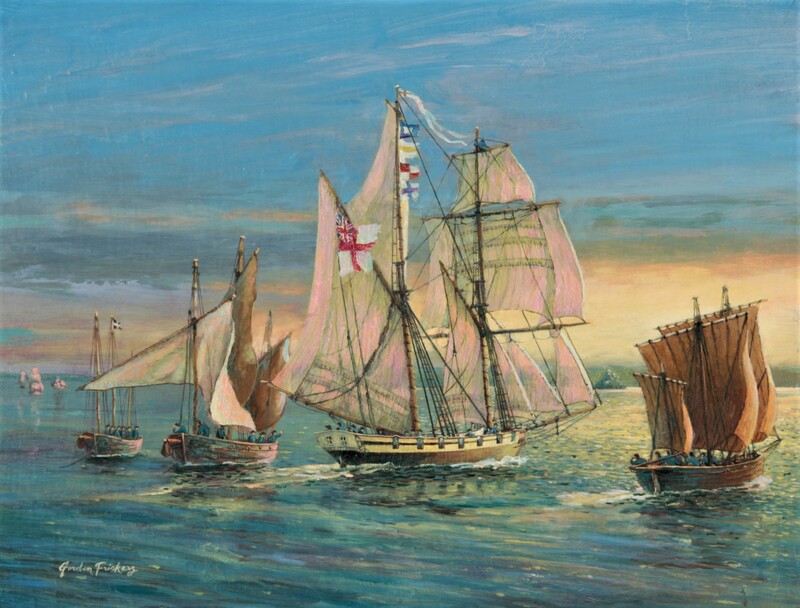 Marine art for sea orientated people, a timeless painting, a pleasure every time you see it upon your wall. Looking for the very best in modern painting, for your pleasure and as an investment? 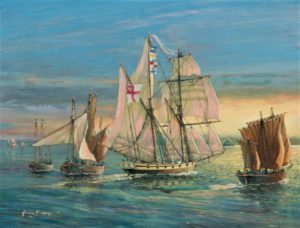 Early on in the morning of the 4 th of November 1805 the schooner HMS Pickle, carrying the official Trafalgar Dispatch sailed herself into a Cornish legend. Many scholars have said they doubt the story is true. 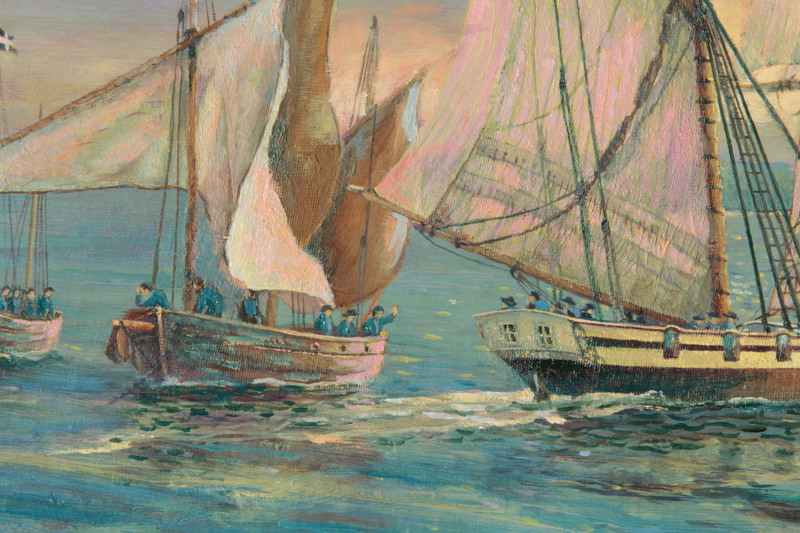 It is said with pride in West Cornwall to this day, that as HMS Pickle coasted across Mounts Bay, driven with all sail set even her steering sails and ring-tail, into the sunrise by a light South westerly breeze, her men spoke the epic news to local fishermen. Despite academic doubters, the event is still celebrated in west Cornwall, every year. We know from documentation HMS Pickle was based at nearby Plymouth, that she regularly patrolled Cornish waters when not employed as a dispatch vessel or on duties for Nelson. 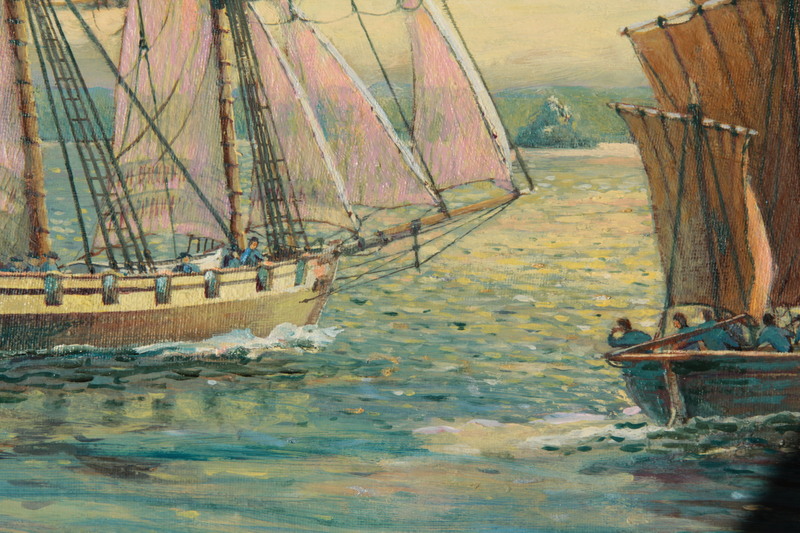 Pickle experienced several chases and engagements with French privateers on that station. Therefore to Cornish fishermen, she would have been a familiar sight. 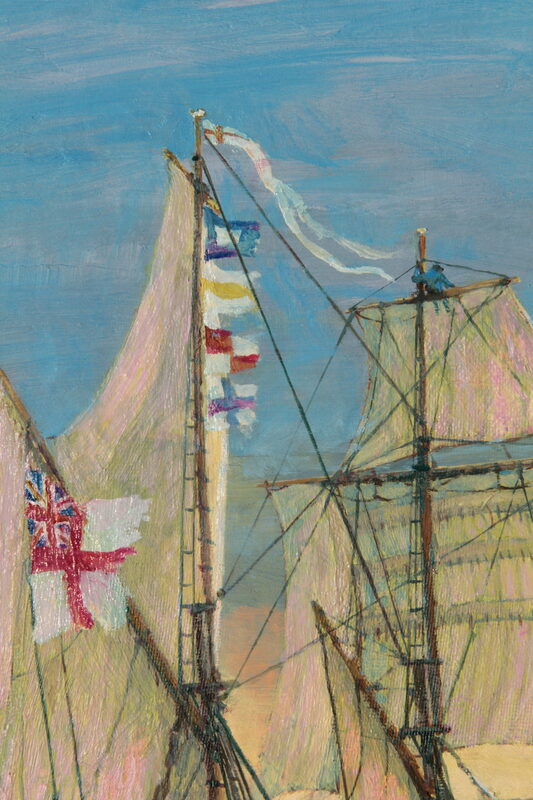 From newspapers and gossip, the Cornishmen are likely to have known Pickle was away with Nelson’s fleet, she being one of his hard worked scouts and a fast dispatch vessel. They would certainly have known a great sea fight was very likely soon. 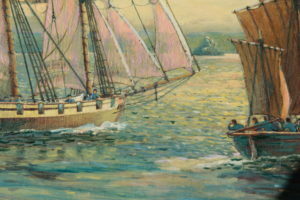 The crew list suggests much of her crew including her commander were Cornish and Devon men. Cornwall is now as it was then, one big family, some Pickle crew had probably sung, drank and laughed as sailor men do, with the men fishing that morning in Mounts Bay. What is your conclusion dear reader? Having sailed this waters for many years and lived, worked and played among the people of West Cornwall, I have little doubt the story is true. For this painting or to commission a similar painting, a pleasure to own, a sound investment, your easiest way is by instalments, bank to bank, ask us for details, or using PayPal via the Purchase Page. Further reading: Background history, images and the development of this painting. 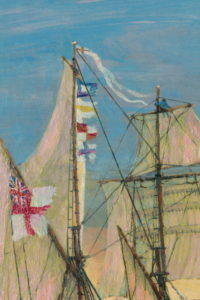 This painting is similar in composition to my “Trafalgar Messenger” however the colouring is very different. I like very much the story behind the picture, so as have many of my most illustrious predecessors with their works, taken two shots, this being the newest and probably final.